Depending on which source you use for research, the origin of the “Hamburger” is attributed to the United States, Russia or Germany. For me, as a German, it’s Germany, of course, with maybe some Russian influence like the steak tartar. The period between the late 19th and early 20th century marks the start of the Hamburger’s extraordinary culinary history – from being a classic fast-food item in the beginning to now a regular dish on restaurant menus that keeps reinventing itself all the time. The Hamburger is believed to have been invented in Hamburg (Germany) as the “Bulette,” a steak made from minced meat, and brought over by immigrants to the United States. Put between two simple slices of bread, the dish evolved from the Hamburg steak to the Hamburger sandwich. One source places this key happening in a small town in Texas. Others credit the founder of the White Castle restaurants. Another possible father is Charlie Nagreen of Seymour, Wisconsin, who sold Hamburg steaks at a local country fair. He wanted to meet people’s desire to freely stroll around and eat, so he put the steak between the bread slices. 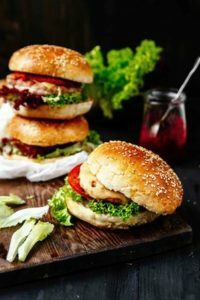 Its industrial production and the chain restaurants are responsible for popularizing the whole “burger family” and making it as it is widely known — a small, thin, well-done fried patty and salad in a bun with a special sauce. The burger has needed the foodie movement around the world to also make it a popular item in high-end restaurants and to create a restaurant niche focusing on burgers at their best. High-quality ingredients (especially the meat patty, its core! ), including organic and Wagyu beef, are used to make a bigger and better patty which can be grilled to taste. Lots of fancy and tasty variations are available nowadays. A hamburger is a hamburger, but there’s such a wide variety of ingredients and tastes. This is just fantastic! However, my all-time favorite is a grilled medium-rare burger with a melted slice of Swiss cheese and some dill pickle in a brioche bun. How will you grill yours on Burger Day?